Taylor Equipment has been doing business in Central Texas since 1985. Our longevity is a direct result of offering our products at the best prices in Texas and genuine customer service. The dealership has been rated 1st in the Nation many times since the opening of it’s doors in downtown Taylor, Texas. You only get that type of honor by committing to making sure, when an individual walks through the doors of our establishment, they’re treated as family, not just as a customer. We’ve since grown to a new location just east of Taylor, offering a wide range of tractors, construction equipment, mowers, RTV (utility vehicles) and accessories to equip every item to your liking. Taylor Equipment understands that you can do business anywhere you want, that’s why we work hard to offer the best line of products to you, at the lowest price, and have the parts and service departments to back your purchase. Being in the country, lets us keep our overhead down, and word-of-mouth advertising gives us the opportunity to return those savings to you. The delivery of your new or used tractor, construction equipment, mower, or RTV is just the beginning of our relationship, not the end. Speak with anyone that has purchased from us, they’ll tell you why they come back to Taylor Equipment. Because in the country, “we appreciate your business”. Raymond Lenz, runs his business, Taylor Equipment, with his wife Suzanne and son Chad. It’s hard to miss Taylor Equipment, located on Hwy. 79 heading towards Thrall, because of all the orange. 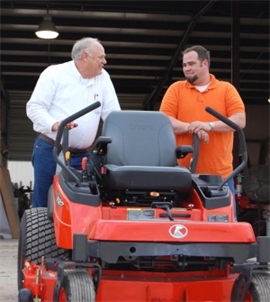 Orange tractors, orange RTVs, orange mowers – if you want a Kubota product, whose signature color is orange, this is the place to find it. When Raymond Lenz bought the business in 1985, the store sold a variety of brands of equipment, and if 20 Kubotas sold a year, they were doing well. And Taylor Equipment has remained open over two decades. Now, the company – which sells exclusively Kubota – expects to sell at least 250 items a year. While there are a number of tractor dealerships in Taylor, this is the only Kubota dealership, and people will come from across the state to do business with Lenz. Dr. David and Mitzi Guitar, for example, drove about three hours from Brownwood to purchase an RTV for their ranch, where they live and run their veterinary business, even though there was a Kubota dealership closer to home. So how do people so far away hear about Taylor Equipment? In some cases it’s traditional advertising or the company Web site, but ultimately, it’s word of mouth more than anything else that brings new business, said Lenz. Building relationships to cultivate that positive word of mouth advertising has become the foundation of Taylor Equipment’s success. Originally located on Second Street in downtown Taylor, the business moved to its current location on Hwy. 79 about six years ago. They will be having a ribbon cutting event today at 5 p.m., followed by after-hours networking with refreshments, to which the public is invited.